If your family has a love for board games I’ve got a great review for you. It is a cooperative game called Commissioned from Chara Games. This game is designed for 2-6 players and it was created for those ages 14 and up. With some patience and practice however, my 9 year old and 11 year olds were able to play and enjoy the game just fine. Like I said this is a cooperative game. I’ve never played a cooperative game before and it is quite different from my usual game playing experience. Every play actually works together to achieve the goal of winning the game. Either everyone wins or everyone looses. This game has a great theme. It focuses on the history of the early Christian church through the eyes of the apostles as they spread the gospel and planted churches throughout the land. It even includes references on some of the cards so you can dig into your Bibles and learn more about what happened during the Apostle’s time. The goal of the game is to new churches across the land and add books of the Bible to the canon. Once you work out and understand how to setup and play the game it typically takes about an hour to play. My suggestion is to have parents play it on their own and then introduce it to the children. It will just make it all that much easier to learn. Each player actually takes on the identity of of an apostle. Each apostle has unique gifts and strengths that come in handy throughout the game. You use your apostles skills to work as a team with the other apostles to grow the church, collect the New Testament books of the Bible, and work through so many trials. Chara Games has provided us with a very handy instructional video that walks new players through the game step-by-step. Thank goodness because this is one those pretty intense, complex, roll playing type strategy games. Between the video they provide and the glorious, detailed, and lovely instructional manual we were able to tackle this challenge. Once you play it once, however, you’ll be good to go. Commissioned is a game played in rounds. Players move through a serious of tasks repeatedly to achieve their objects and over come trials. Each player takes turns acting as the group’s Elder (or ultimate decision maker). All together the group reaches a victory if they can move through the entire deck of Trial cards without loosing the five churches. Once this style of game play is mastered you can tackle other scenarios making this a really diverse game that never gets old. THIS GAME! It’s amazing. Players learn about the hardships the apostles faced. Pair it with a bit of Bible study and you can really get to know some of these amazing men of the early church. PLUS! What a gift to share with friends who perhaps LOVE challenging games but do not know Christ. It could be the perfect segway to some amazing conversations within the family or with someone contemplating who Christ was. Chara Games has impressed me with this first experience with them. They are developing other games and they are launching their new newest game 3 Seeds. This game is a strategic game for 2-5 players. Check it out by clicking the link. Grammar and all of the rules of writing seem to be a tricky thing to grasp for my boys. I don’t understand why. I’ve drilled some of these concepts like tomorrow isn’t coming unless they get it. Nope! A week later I’m still hollering at them to make sure they use upper case letters and periods. Go figure. When we got the chance to review Language Smarts™ Level E Grade: 4 from The Critical Thinking Co.™ I was rather excited! (My 9 year old son might not have been ha!) I figured this might the ticket to help fill in some gaps I’ve noticed we are missing. Language Smarts starts with Level A, for kindergartners, and has a stand alone book for each grade level through 4th grade. Language Smarts™ Level E is geared for fourth grade and contains about 400 full color pages. It is a full curriculum intended to teach reading, writing, grammar, and punctuation. Also included are critical thinking skills and vocabulary. This program is about as straight forward as you can get. The lessons are easy to follow with all of the information and directions provided right on the page. NO PREP WORK FOR MOM! It is so easy that there isn’t a need for an extra teacher’s book. If you need the answers you’ll find them in the back of the book. Activities are fun and include lots of puzzles like word-searches and word jumbles or fill-in-the-blank type activities. There is plenty of color and interest on the page to hold most children’s attention. The book begins with lessons on syllables and moves into word parts like prefixes, suffixes, and roots. Next you’ll learn about synonyms, antonyms, anagrams, analogies, palindromes, and jumbles… many concepts I myself could brush up on. There is also spelling and proofreading, a unit on reference materials, using a dictionary and a thesaurus and of course an encyclopedia. Near the end you’ll cover things like nouns, verbs and all of the like. Before you are finished there will even be lessons on publishing. This book could be fantastic all on its own. Simply start at the beginning and work your way through. To finish it in a typical school year you’d want to cover about two pages per day. You child will come out with a vast knowledge of reading/writing/grammar. Or use it to supplement other course work. Should your child need a little extra practice in some area you can just look up the topic in Language Smarts E and assign the pages. This book has taken up permanent residence in our daily curriculum line up. We skipped the section on syllables and jumped right in on word parts and we’ve been moving through it ever since, about 2 pages 3-4 days a week. My 4th grades is able to mostly complete the pages on his own 15 or so minutes. I check the work after. Easy Peasy! He enjoys the work as he finds it makes sense and expectations are clear. He is learning new material yet he isn’t strained to complete the work. This is a simple and comprehensive program. If you want something easy on you and your child than this program could be a very good choice. Reading, Writing, and Arithmetic Before Kindergarten!™ – where you can see the 5 different apps that they have. These programs are designed to help you teacher your preschooler the full range of letter sounds and early phonics. If you have a preschooler you really should check this out. My homeschooling kiddos are big fans of unit studies. 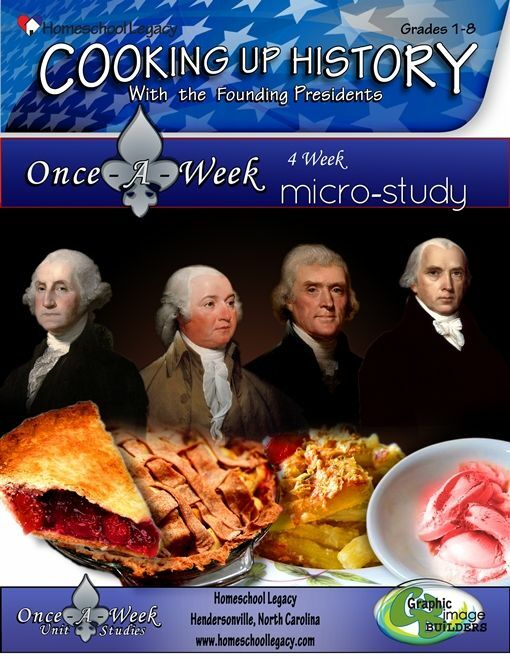 This homeschooling mom is a big fan of Homeschool Legacy unit studies like the one we recently reviewed called Cooking up History with the Founding Presidents which is a Once-a-Week Micro-Study. This particularly study happens to be what Homeschool Legacy refers to as a “microstudy” which means you learn a lot, in a short time, with ease. What on earth could be better? Oh… and this is cooking… cooking/learning projects/eating all rolled into one? I’m came out looking like a hero in this house! Homeschool Legacy is a sweet little company created by veteran homeschooling mom Sharon Gibson. You can see here that I’ve written about her unit studies before… actually my family has completed quite a few of them. Did I tell you I was a fan? I once had the pleasure of meeting Sharon when she traveled to the MassHOPE conference near me in Massachusetts a few years back. We had a fabulous time chatting about her work and how much my children enjoy her studies. Sharon has been in the trenches, she knows exactly what a homeschooling family needs in a great unit study. Micro-studies are the best. The best way to describe them are… short unit studies. I know it sounds so complicated! Ha! No worries though, these studies are jam packed with valuable information about whatever the topic may be. And you, the homeschooling mom, are free to expand or shorten them in any way you wish. These studies are PERFECT on their own or you can use them as add-ons to whatever your favorite curriculum happens to be. These micro-studies, if done are their own, are perfect to fill out a whole week’s worth of work or they can be completely in just one day a week over a month. (or twice a week over two weeks) They are so flexible. Cooking up History with the Founding Presidents was the PERFECT study for my history adoring children. Oh, and cooking! If anyone knows anything about my family they know that my 9 year old son is a truly talented and budding chef. Let’s add American History and cooking together and oh my goodness the heavens have parted. The most exciting thing? Even though my children have read just about every biography and text on every president they can find… (especially the early ones) they still learned so much. I mean, First Lady’s are included… come on now! This Micro-Study is broken into 4 lessons and with each lesson you learn all about another president. Then you cook up one of their favorite dishes! Yahoo! This study was so simple to do. We hit the library and took out our favorite books on each of the presidents in order to help us round things out. We didn’t have to though and don’t feel like you should either. The beginning of every study covers some great facts about each President and it is really all you need. There is a complete supplies list provided so you can be super prepared. The recipes and directions are all provided in easy to follow language. This is such a no brainer. You can’t loose. This study comes as a downloadable PDF which you can print out for your own use (and destroying while cooking). However, following along on the computer has advantages since you can easily access the links she’s provided. With just a click you’ll find yourself watching some great videos and digging into some very helpful information about the president you are studying. The recipes themselves are simple. I’m not much a chef myself and I’ve only sort of conquered my fear of the kitchen (sort of) in the last year or two. Of course with my chef son on my side I wasn’t really needed. I do want to point out that we didn’t follow the recipes exactly. My family is dairy, egg, and oil free. No, we don’t even use butter or margarine, not even the dairy free kinds. That wasn’t a problem. We are fairly experienced with recreating recipes or outright swapping things to fit the way we eat. For example, with the cherry pie (pictured here) we used our own favorite crust recipe and a crumble for the topping. When we made the vanilla ice cream we used our own favorite frozen banana ice cream. We know how to make things work! Be sure and follow Homeschool Legacy on social media! The internet is a dangerous place. There, I said it. Children (and adults for that matter) can be easily lured into inappropriate conversations (or relationships). There are so many inappropriate websites with content that can do permit damage that I shudder just to think about them. This is a subject my family takes incredibly seriously. We are always looking for the best resources to help our family avoid the traps of the world wide web. How can we enjoy the wonderful benefits of the internet while staying clear of the dark places we shouldn’t go. This is where the Family Plan from Accountable2You comes in. Accountable2You is a web based program that helps your be accountable to their travels on the web over multiple devices. Their goal is to help you and your family build character. As we all know, if someone is keeping us accountable to our actions we are less likely to to do that which we know we shouldn’t. This is what my comes to my email each day. I can see at a glance if the program thinks my children have visited any questionable sites. By installing their software on all of your devices and computers, your family’s online activity will be monitored and a daily report will be sent to whoever the accountability partner might be. Along with accountability reports, Accountable2You also offers quite a few customizing options for use in your family, group, or even your business. This is what I see when I click view app usage. By installing the software (or app on a mobile devices) and determining who the accountability partner (or partners) might be, you set yourself for a powerful way to monitor the internet usage of your entire family. The accountability partner can receive reports daily or weekly. The emailed reports contain special alerts or indications if the user has traveled to a questionable website. You can even receive instantaneous alerts of highly questionable activity. Every bit of this is customizatable per device. I love this, now I can clearly see if my son has used his laptop at a time that he wasn’t supposed to. Other features include GPS tracking for some devices, time limit alerts, and the ability to customize with your own list of objectionable and non-objectionable words. You can even determine how strict the alerts will be per device because Mom and Dad should be able to visit some websites that a younger child shouldn’t. Here I can see the exact places my son has visited. Individual Plan: Great for monitoring a teen, a spouse, or yourself. Family Plan: This is the plan we chose. You are able to monitor up to twenty devices and multiple family members… including children away at college. Group Plan: This plan might be well used by a youth group, homeschool group, or other similar groups. Each user can have up to 6 devices. The administrator for the group is limited in what he/she can view however each person’s accountability partner is not. Small Business Plan: This plan is meant for the small business owner whose employees have internet access. I love this program. It works very well for where we are right now. I installed it on each of my children’s laptop computers. Now I get a daily report that tells me exactly what they’ve been up to on the computers, even if I’m not in the room. I can now see if they are using them when they shouldn’t or if they are visiting places they aren’t supposed to be visiting while they SHOULD be doing school work (ahem… Lego.com). I can see if they visit sites I’ve specifically told them not to visit without my supervision (YouTube). I can see how much time they are online. And yes, I know instantly if they are attempting to stray any place inappropriate (whether innocently or on purpose). All of the information comes to me with a daily email. It doesn’t get any better than that. I had contemplated putting the software apps on mine and my husband’s phones but truthfully we decided it wasn’t worth it for US. The app tracks your internet usages if you are using the app. If you use Safari or Chrome or any other smartphone web browser than it cannot track it at all. Some day, when our children have mobile devices this will be the first thing we install. We can remove the other browsers and lock down the ability to install anything. If they want to visit the web they’ll need to go through this app. I very much love that idea. Two thumbs up. What a great program. It is an invaluable addition to our home. I highly recommend this program. If there is anything that my family seems to get a big kick out of it is receiving gifts with their own names on them. Placing someone’s name on a gift seems to make things extra special. CrossTimber, however takes it a step further when they include the meaning of the name as well as a Bible verse. CrossTimber is quite the amazing little company with a unique passion for sharing positive and encouraging name meanings through beautiful name meaning gifts. CrossTimber is a family business had its start as a photography and printing business. What began as a homeschool project has blossomed in a beautiful company centered on lifting up others with unique name meaning gifts. The owner John loves to research the history and meanings of names and he will personally look up any name you provide to help you choose the perfect gift. For this review many, Review Crew members were offered a Personalized Framed Plaque with Name Meaning and Bible Verse to review as this is the core product that CrossTimber offers. There are many examples of this on their website. I however am a lover of all things coffee and I couldn’t pass-up a gorgeous coffee mug so I asked for that option. It did cost me a couple of dollars to cover the price difference but I was more than happy to pay. I emailed John my chosen name (my own-Crystal) and he promptly replied with the meaning. Yes as soon as I saw it I knew I had to have that on my mug every morning. So what does the name Crystal mean? Well I have to say I wasn’t entirely surprised by the first part… from Latin in means “Sparking, Enduring, Strong.” Ha! Crystal means sparkling… who knew. Enduring and strong too? Yes just the message I needed to give myself every morning. LOVE IT! Also included was a scripture chosen for me… I asked if you can personalize that and I was told yes you can. I love filling my life with positive Biblical reminders and this mug is a sweet way to do just that for myself… every morning. A fantastic bookmark was tucked in my order as an extra tidbit for me. I love it and it now lives in my Bible. The ordering process was very easy. I chose my product and flipped through a great variety of background choices. Actually this was the hardest part for me personally. WHICH BACKGROUND SHOULD I CHOOSE? Once I had all of my options picked out I just hit order and it was done. It arrived promptly wrapped in special foam to keep it perfect while shipping. How can this get any better? You’ll want to enter this fantastic giveaway ASAP. My readers are eligible to enter a giveaway for a Grand Prize of a free Name Gift or nine second prizes of $10 gift certificates. Click on the link to enter. The giveaway ends on December 4th 2016. Christmas Giftaway page. I LOVE my mug! This is a sweet company to support and they offer a fantastic product. They are the perfect gift giving solution for this holiday season. You can’t go wrong with this one. Buying a lot of gifts? They offer discounts and other tidbits that you’ll enjoy. Curious about the kind of options you’ll have when ordering… check out this graphic. This gives you just a glimpse of the numerous choices you’ll have when selecting backgrounds, frames, etc. I’ve got another foreign language curriculum to review for all of you! I’m excited because too many of us moms sadly grew up in the American school system where we might have gotten a few years of Spanish or French and then promptly forgot it all 10 minutes after we walked out of high school. How do we tackle teaching our children a new language? This makes me sweat far more than the idea of teaching upper level math (and that’s saying something considering I was a pre-calculus dropout). I’ve actually had the chance to review for Middlebury Interactive Languages in the past. That time we took up the opportunity to their German class but this time we took on what, in my mind at least, was a much bigger challenge… Elementary Chinese 1: Grades 3-5. Why would I choose Chinese? Of course we love to stretch ourselves and experience new things. We are also studying the Eastern Hemisphere this year and we started with China. So this review felt like a great fit. I used this program with my 8 year old son Ezra but his older brother Noah often looked on. He couldn’t help it as it sort of draws you in. But now I’m getting ahead of myself. Middlebury Interactive Languages uses an immersion approach to teaching children foreign languages. I LOVE this approach. I despised my experiences with learning foreign languages because for me it was always very dry, memorizing long lists of on sort of related terms or phrases. Then we tried to apply those terms to stilted made up “conversations” within the classroom. Middlebury takes an entire different approach by introducing children to the language within the context of every day life or through memorable stories and this makes it all… well… memorable. All of Middlebury’s courses are completed online. You choose your course based not only on the language but by both the grade of the student and their level in the language. Elementary levels are broken down by grades k-2, 3rd-5th, and then you enter the Middle School and the High School levels. It is easy for children to start early with a language and work their way up until the gain fluency. All of this is done through the use of cultural stories, songs, art, and more. If you are diligent your child will learn to read, write, and speak the language of your choice. About three days a week Ezra would log onto the website and begin his lessons. Elementary Chinese 1: Grades 3-5 is broken down into 16 units and each unit contains 6 lessons. Through these units your child will learn the Chinese words for things like, food, places, animals, etc. It begins with numbers. All of the units contain a variety of activities including a speaking lab (where children record themselves saying the words and then play them back – microphone required), matching the Chinese words to English words, learning Chinese characters, and lots of review. Most new materials is presented through cultural stories (like legends or folktales) and songs. The language the children hear and copy is all taught by native Chinese speakers. At this level it is assumed that the child has no previous experience with the language and they begin with the basics. Included are some printables for use as well. Ezra loves this program. He finds it a challenging yet fun. He retains the information he’s learned well enough but the built in review is essential and he appreciates it. The program itself functions well. Navigating to lessons or through lessons is pretty intuitive and we didn’t experience any technical issues. I love this program because it is so easy on me! I have nothing to plan or prep or research. My son is learning a language that I don’t otherwise have the resources for him to learn. He is also learning more about a great culture of the world. Everything is self-graded and I, as the parent, can log in and review his progress whenever I’d like. Can there be anything better? If there is one thing I’d change about this program I’d ask for more time with it. You are given just 6 months to complete the course and with a language this difficult I’d really like a 9-12 months. Christmas is coming! Did you hear my sing song voice when you read that? I’ll be honest, I’ve had many Scroogey years where I just about dreaded the holiday season. For some reason this year my heart is singing when I think about Christmas. First, it is the time that we remember Jesus’s birth and that alone is filling me with Joy. How great is our God that He would send us a savior to take the punishment for my sins? Beyond that though I am also really looking for to the festivities. We’ll have Christmas carols, and lights, and foods, and classic movies, and STORIES. Yes! I love stories with a Christmas theme to them. It is with great joy that I get to tell you about some fantastic audio Christmas stories that my family has recently been blessed to review (yep, Christmas spirit has come early around here). Over the last several weeks my family has been listening to The Familyman’s Christmas Treasury – Audio Collection from The Familyman. These are also available as Digital Downloads. I’ve been a follower of Todd Wilson (creator of these stories) from The Familyman for several years now. He brings a unique brand of fun humor to the homeschooling parenting life through his books, comics, and podcasts. Now he’s used his talents to write these very fun stories. On top of it all The Familyman chose possibly the best person to record and narrate the stories. Jim Hodges is a voice well known in my household as we’ve enjoyed many of his audio book records. Finding out it would be his voice we would be listening was like the cherry on top of this very fun review. For this review we were sent digital downloads of the six stories from the collection PLUS two additional stories that are only available in digital format. Let me tell you a little bit about a few of the stories. I’ll start with Cootie McKay’s Nativity as I think this was our absolute hands down favorite of them all. This story features a man by the name of Cootie McKay who is a bit of an outcast in his own town. He is a creative man whose eccentric ways have ostracized him from those who live around him. When he is called upon to fix the town’s Nativity scene he not only comes through in a spectacular way but he also finds Jesus in the process. The entire town is blessed. The Stranger… It is so like us to turn away from those who are different, dirty, or even smelly. We might not even invite them into our church or our home if they arrived asking for help. Oh how this story provided for so much conversation… and perhaps conviction on this momma’s heart. Captain Chaos … this one has a bit more of a superhero theme running through and what fun that is. A bit unexpected in a collection of Christmas stories. As Captain Chaos actually erases the entire birth of Jesus from the history of the world and we, the listeners, are left to see what the world would might have been like without Him. The Bishops Dream… I personally was quite interested in this story. We are a Santa believing family however I’ve always approached the idea of Santa from the history of Saint Nicholas. What would Saint Nicholas think of the Christmas we celebrate today? Hmm… lots to think about. Each and every story points back to Jesus and the true meaning of Christmas. Every story is a true blessing. We’ll be keeping these on repeat throughout this and probably every Christmas season for years to come. These stories are short and sweet, just about 15-30 minutes each. They are perfect as a before bed listen or in the van as we run errands around town. You can also find more information on this product by visiting the Familyman on: Facebook, Twitter, Instagram, Pinterest, Google Plus or on his Blog. 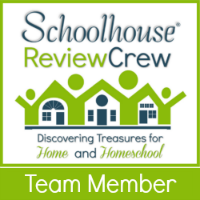 Let me tell you about one of our latest homeschool products we have received…. it is called Educeri Lesson Subscription Service from Educeri ……. Educeri a division of DataWORKS . It is full of thousands of lessons for grades K-12 for in a wide variety of subjects. What a bountiful resource. Of course when you first hear of resource with literally thousands of lessons to sort through you can feel a bit overwhelmed. Have no fear, the website is well laid out and pretty intuitive for its navigation. You are able to sort through lessons by grade and subject so that you can find just the thing you are looking for. You will find lessons for Math, Science, History, Art, and more. This program was originally designed for use in the traditional classroom but it can be effectively use with just one or a couple of students. If you are a classroom teacher and you have the proper equipment you can display lessons from you computer onto a wall or smartboard for a roomful of children to see. They lessons are usually pretty easy to follow as you just click through and follow the step-by-step instructions. It is probably important to note that Educeri is not a complete curriculum but a great resource for supplemental resources to reinforce or expand a student’s knowledge. I used the Educeri Lesson Subscription Service with both of my older boys ages 8 and 10. My older son needs reinforcement of all of his math skills, constantly. He is the type of child who will loose a math skill if he isn’t constantly reviewing it. With him I tended to skip around the math grades and hunt for lessons that had him reviewing math facts at all levels. I found it fast and easy to find just what he needed and set him to work. Since the program does align with Common Core we were unable to really dive into the math lessons beyond the reviewing of facts since Common Core math isn’t something we study in our homeschool I did feel a bit limited in this regard. The lesson called Memorize Multiplication Facts was a good one for my son. As all of the lessons from Educeri it was well set up and my 10 year old could work through things pretty independently. For this lesson we printed off a series of student worksheets to be filled out and then he checked his own work on the computer against charts of multiplication facts that would be filled in automatically as he reviewed a fact. Both of my boys are major history buffs and they quickly found the history lessons all on their own. I can’t even tell you honestly everything they looked at since they were able to do this completely independently. When I looked in on them I was able to determine that a lot of the lessons are mostly reading material from a slide on the screen. It reminds me a lot of power point presentations. My boys enjoyed picking through the reading and comparing it to information they’ve learned from books and other studies. My overall thoughts about this program is that is a very nice resource. I mean how can it not be with over 1000 lessons right? It is well laid out and it works smoothly. Finding what you need is easy and that is important when you are looking at what might be a treasure trove of possibilities. The fact that this program is geared toward a traditional classroom experience is pretty obvious. How fabulous this might be for a family that is just getting started with homeschooling. I’ve heard many families tell me they feel they need to use materials that are similar to what their children saw in school in order to ease the transition to the home setting… or even to simply make the homeschool parent FEEL like they are covering all basis. If this is you you might really enjoy this program. I think the best way to figure out if this program is right for you is to check out the 30 day free trial. You will get unlimited access to the 1,000+ lesson plans. Click here for more information. I want to share with you a review of something that I’ve been using more for myself than with my children… though its totally appropriate for really the entire family. It is called Working it Out: Poetry Analysis with George Herbert from Everyday Education, LLC. I’ve incorporated this into my daily Bible study and devotional time and I am so glad that I did. It has added a richness that I am very much enjoying. Working it Out: Poetry Analysis was created by Joseph Womack. It uses poetry from the 17th century written by George Herbert. Personally I had never heard of him before but it turns out his works have been well known and studied by many including the likes of C.S. Lewis. His poetry reflects his own “working out” of his Christian salvation and the themes of the poem reflect that. George Herbet lived during the time of King James I. He was a priest, a poet, and instructor, and an orator. King James stopped George Herbert’s attempts to enter the ministry so he went on to become a Public Orator and serve in England’s Parliment. Finally he was ordained into the Church Of England where he remained until his death. No workman’s tool hath touch’d the same. These stones to praise thee may not cease. And sanctify this ALTAR to be thine. As you can see of course anything written in the 17th century will be a bit of a challenge and therefore each time I tackled a new poem I found myself rereading it several times over. Then I would begin the lesson as laid out in Working it Out. After a few poems a pattern begins to emerge and you’ll realize you work through every poem in much the same way. These Poems coupled with the analysis, reflections, and scriptures so spoke to me. I found myself copying them down, or parts of them, and displaying them with scripture around my home… on my mirror or near my computer monitor. Sometimes I even felt led to share them with someone I knew needed to be uplifted. The study has touched more than just myself. All in all I’m getting through about two poems a week spending maybe 20-30 minutes per poem. There are 51 poems included in this study and it is suggested to do just one a week. If you are working on this with middle school or high school aged children it could certainly take you a year to complete. Of course the important thing to note however is that this technique of poetry analysis can be used with virtually any poem! Once you are done with these you can most certainly apply it all to another. You can purchase Working It Out is as either a printed book or as a PDF download. There are over 200 pages and features 51 poems with analysis. There is a sample of this poetry study at Everyday Education so you can check it out for yourself too. I plan to add this into my oldest son’s studies in the next few months. I’m looking forward to looking at these poems together. I think it’ll be as heart transforming for him as it has been for me. Books! Books! MORE BOOKS! Books to me, especially children’s books, are to me like shoe or handbags might be to some other women. I have been collecting children’s books for 20 years. Mind you my oldest is only about to turn 11. My addiction…err… collection began long before he was born. So when the opportunity to review four books in the If You Were Me and Lived In.… series, brought to you by Carole P. Roman and Awaywegomedia.com I leaped at the opportunity. This isn’t my first time experience her books since I had the opportunity to review her Children’s Introduction to Cultures Around the World…. series a few years back. I received If You Were Me and Lived in…Ancient Greece (An Introduction to Civilizations Throughout Time) (Volume 1), If You Were Me and Lived in…Elizabethan England (An Introduction to Civilizations Throughout Time) (Volume 3) If You Were Me and Lived in… The American West (Volume 7) and If You Were Me and Lived in… Ancient China: The Han Dynasty. The If you Were Me and Lived In… series aims to teach children about some of the greatest civilizations and cultures in history. These books speak from the point of view of a child who may have lived during the period of time the book represents. We learn all about the lives of typical being during that time from the clothing they wore, the foods they ate, their jobs, art, customs, celebrations and more. These books are packed with information. Each of them is at least 50 pages long with great color illustrations and pages jammed with text and information. Since we are studying Shakespeare and China this year (great combo right? keeps me on my toes) we spent quite a bit of time with If You Were Me and Lived in…Elizabethan England and If You Were Me and Lived in… Ancient China: The Han Dynasty although all four books share the major characteristics I’m about to describe. The language of these books is pretty simple and geared toward young children. There isn’t complex vocabulary or confusing information. Everything is laid out cleanly and plainly. Her is a short of example of some text form the Elizabethan England Book. You might have lived in a house on cramped street in the heart of London over the bakery your parents owned. The pictures are detailed yet clear and simple. They clearly depict the hard life of your average family. Interestingly the style of art differs from book to book. The illustrations in the The American West and Elizabethan England are done with what looks like pen and ink with sharp lines and solid color. The Ancient Greece and Ancient China: The Han Dynasty are done with more of a whimsy water color effect. Both styles are fantastic and serve the purpose of providing visual detail well. One very neat feature at the end of each book is the glossary. I love how words specific to the time are well defined. For example, I had never heard of the word trencher and in the Elizabethan England book we learned that it is the bread used as a platter. When the books arrived my children immediately scoffed them up and read them through almost instantly. My 8 year old read them aloud to my 6 year old who then spent an hour pouring over the pictures on her own. During our typical school time I chose to read each one a few pages at a time and draw from them discussion that interwove with our usual studies. They were great for inciting conversation about the life of the time period we were studying. They are very detailed and so full of great information. What you have in this book is all of the information from many library books condensed into just one book. Very convenient. We really love these books and are considering investing in the books we did not get as a part of the review. What a great addition to any home library.